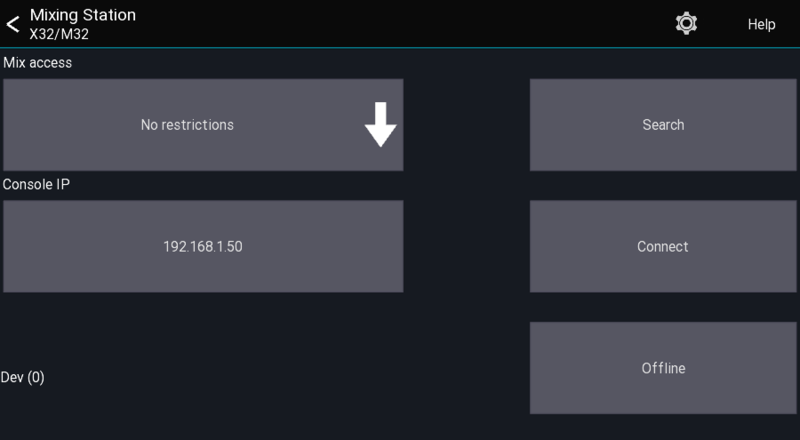 The offline mode provides access to nearly all app features without the need of connecting to a mixer. When opening the app you'll see the launcher view. This view allows you to configure where and how you want to connect to the mixer. Mix access allows you to restrict access to a certain mix bus. The user will not be able to change any other mix than the one selected. This field allows entering the console IP address. It's only used the using the Connect button. The top menu gives you access to the global settings as well as this help page.